Perfect for baking. 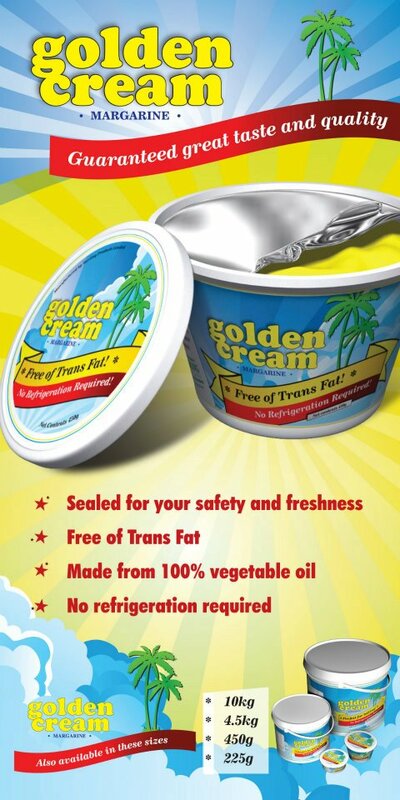 Free of Trans Fats. Requires no refrigeration. Available in convenient, resealable retail tubs in 225g and 450g sizes. Also available in attractively branded, UPC bar-coded, reusable and resealable buckets in 4.5kg and 10kg sizes for retail, foodservice and club-store channels. A 22.7kg carton is also available for the foodservice channel. Golden Cream Margarine and Puff Pastry Margarines are widely used and favoured by many bakeries in Trinidad today. Call us today for pricing and experience our first class customer service. We deliver to all parts of Trinidad.